Whether you're looking to build a new dock system or repair a current floating dock, Dock Boxes Unlimited has all your dock building supplies. Floating Dock Kits are available for fast and easy installation, shipped to you ready to install. • Triangular truss underwater bracing constructed of 1 .5" X 1 .5" X .187" angle iron and .187" rebar • 108" Down legs composed of 2.5" X 2.5" X 96" x 11GA galvanized square tubing • Down legs attach to triangular truss using grade #5 bolts • Connection plate composed of 4" x .187" flat strap • 3" X 2" x 12" x .187" Angle brace bracket connecting to 3"x 3" x .187" connection angle • Grade# 8 bolts securing brace bracket assembly direclty to substructure frame • Grade #5 bolts attach downlegs to underwater brace brackets • All structural and steel components are hot-dip galvanized or galvashield material. Dock Boxes Unlimited offers volume pricing options for commercial buyers. Choose your products of interest, then request an estimate for volume pricing. Our floating docks are built to last, offering state-of-the-art construction for years of use with low maintenance. Our docks are pleasing on the eye, but they’re also easy to install, meeting even the most challenging harbor design. With quality assembly, spectacular looks and easy maintenance, our floating dock systems are simply a cut above the rest. We also have aluminum dock gangways and bridges that are capable of spanning over 100 feet between supports and floating breakwaters for reducing waves. Floating Docks and Floating Dock Systems from the Ultimate Marine Source are an engineering marvel. 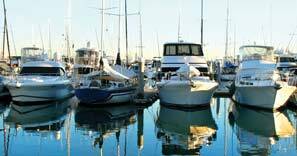 Our boat docks offer state-of-the-art design, easy installation, years of low maintenance and spectacular looks. In cooperation with a professional engineering group, experienced local contractors and client's consultants, we succeed in meeting the most complex harbor design challenges in our floating dock systems.